One only has to arrive at Dublin Airport and walk through the arrivals area to see the impact O’Neills has on Irish sport: the walls are decorated with famous GAA shirts and there is no escaping the O’Neills brand name as it is proudly displayed on nearly every shirt. The ongoing developments within our Strabane-based manufacturing facility have allowed us to drive forward new technical aspects of production whilst allowing us to increase our online store market to over 1,500 club and education customers across the world. This is due to the increased stock holding capabilities required for a successful online business. Developing a place in the competitive UK market has been a major objective of the sales team. Peter Kennedy, the UK new business manager, and Neil Williams, who manages all the professional clubs, joined the O’Neills UK team 11 years ago with the aim to announce O’Neills as an option to all those looking for top quality, UK manufactured products with a lead time to rival the best of the best, only 3 to 8 weeks for bulk orders depending on product type. With Ben Knight (South of England and South Wales) and Paul Berry (North of England, North Wales and Scotland) now the regional sales managers, O’Neills have 11 sales representatives and an administrative staff, including highly trained graphic designers, totalling over 20 at our Somerset and Lancashire offices. O’Neills recognises the need for flagship brands. Young people especially are very brand orientated and whilst in Ireland everyone knows the brand, this is not always the case on this side of the Irish Sea. As one of the brand leaders in Rugby League and supplying Super League clubs Catalan Dragons, Huddersfield Giants, St Helens and Warrington Wolves, O’Neills recently announced a major global signing with Australian Rugby Union franchise Brumbies. The Brumbies shirt is iconic and, after only a couple of new season matches, is already proving a hit. 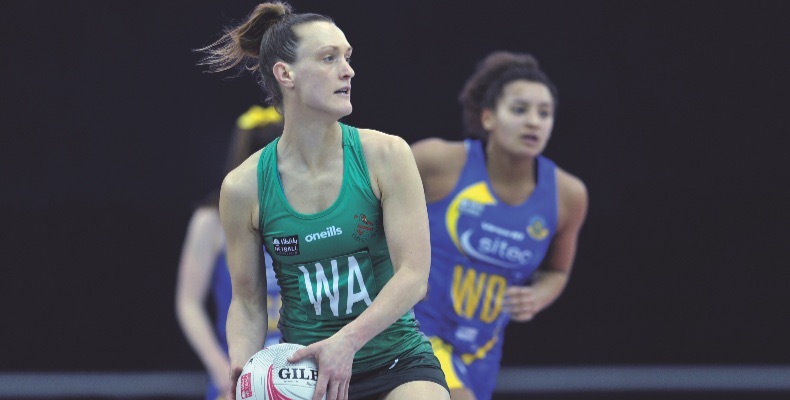 England winning the Commonwealth Games Netball Gold Medal and growth of the game in and around the Vitality Super League significantly contributed to O’Neills forming the current partnership links with the Wales and Celtic Dragons Netball teams. Sell-out crowds are watching these matches, TV coverage is on the increase with Sky Sports and a significant number of schools, colleges and university teams are now wearing O’Neills netball kit. Creating bespoke kit is not just a specialism, it can offer unique opportunities for those who have an eye for design themselves. Many customers have a real input to their kit, as demonstrated by the 1st XI girls at King’s Bruton who have had an unprecedented five years of success. The school designed their own kit with the design team. O’Neills continues to grow its share of the education market and with partners in Independent Coach Education and PADSIS are regularly in attendance at many of their events. Typical of this was the recent ICE Netball Conference where Tracey Neville MBE was able to announce that Oxford HS and Godolphin/Latymer Schools were the winners of a set of bespoke O’Neills netball kits, based on the new designs supplied to Wales/Celtic Dragons. The O’Neills Online Shop facility, based in the Strabane facility, offers customers a three to seven day lead time on pre-agreed products, which can include teamwear in addition to core sports garments. A significant number of schools are now moving to this method of supply as it totally negates the school’s financial output, whilst having a 24/7 platform from which bespoke school kit can be purchased directly. The success of the online platform has been demonstrated by numerous schools (Devonport HS for Boys, King’s Bruton and Manchester GS being key examples) making the move to offer all their school sportswear product via the O’Neills online facility. A further benefit to the schools is a percentage rebate they receive of all sales on their individual sites. For those who choose to run a school shop, such as Blundell’s, there is no longer the need to order massive quantities and wait for months for the orders to arrive. The O’Neills model can deliver in a matter of weeks. Lower than average minimum orders and lead times of three weeks for stock items with embroidery/print and six to eight weeks for specially made garments really does help those finding it difficult to manage budgets. A little and often approach to purchasing can be used to ensure that there is not excessive expenditure at the start of the year. The sourcing of tour kit for large numbers has led to the likes of Kingswood School Bath and Bristol Grammar School turning to O’Neills. Kitting out a tour party of over 80 can be a huge task but, as Tim Reeman (Kingswood) and Fran Ripley (BGS) will vouch for, O’Neills not only eases the ordering process by organising kit sizing sessions but deliver in a four to six week period. If your school is looking for a UK supplier which ticks every box, please do not hesitate to contact us for details on how O’Neills can help your institution. O’Neills will do all we can to develop a platform of supply, whether online, direct or both, which will suit your individual needs.